Drowsy driving can have disastrous consequences for commercial truck drivers. One of the most common causes of drowsing driving is untreated sleep apnea. Sleep apnea is a medical condition where a person's breathing temporarily stops during the night, often many times each hour. Episodes pause breathing for at least 10 seconds and can occur up to 400 times per night. Risk factors for sleep apnea include obesity, lack of physical activity, poor diet, and smoking. The condition affects people of all ages and genders, but there does seem to be a family history link. Sleep apnea is diagnosed with an overnight sleep study. Use of a Continuous Positive Airway Pressure (CPAP) machine is the most commonly recommended treatment, although surgery is effective in some cases. Lifestyle modifications designed to promote weight loss can also help reduce the severity of symptoms. Due to the sedentary nature of their work, truck drivers suffer from sleep apnea at higher rates than the general population. A study from the University of Pennsylvania found that almost one-third of commercial truck drivers have some form of sleep apnea. Since drowsiness, poor memory, and trouble concentrating can make it difficult for drivers to focus on the road, it should come as no surprise that sleep apnea is linked to vehicle accidents. A study from the Harvard T.H. 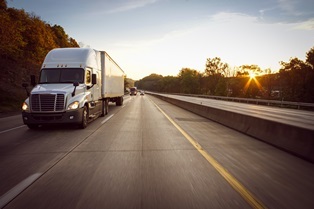 Chan School of Public Health found that truck drivers with sleep apnea are five times more likely to be involved in an accident than their counterparts without the condition. Estimates indicate that about 20% of all commercial truck crashes are caused by drowsy or fatigued driving, which leads to nearly 9,000 fatalities and up to 220,000 serious injuries per year. While not all of these at-fault drivers have sleep apnea, it's thought that the condition is a factor in many cases. However, drivers with sleep apnea who are being treated by a healthcare provider do not have a statistically significant higher crash rate. For this reason, a diagnosis of sleep apnea does not automatically disqualify a driver from obtaining a CDL as long as he or she is complying with the recommended course of treatment. Drivers with moderate to severe sleep apnea can be temporarily disqualified as medically unfit but will regain their right to drive once the condition is certified as being under control. Sleep apnea is a legitimate medical condition, but it does not excuse a truck driver from responsibility for accidents that may occur. If you've suffered serious injuries in an accident caused by a commercial truck driver with sleep apnea, you are entitled to compensation.